Have you ever wished you could attach perfectly shaped, dazzling white front surfaces to your teeth? You can! With porcelain veneers from Sundance Dental & Orthodontics, you can eliminate smile imperfections in just one visit to our Farmington NM office. Porcelain veneers are one of the most versatile items in a cosmetic dentist’s toolbox. They turn ordinary smiles into extraordinary smiles with little disruption to existing tooth structure. 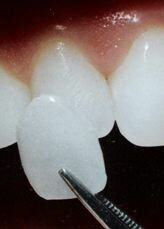 They are quicker, and usually less expensive, than complete crowns. Yet they are made from the same durable, translucent porcelain. It’s no that wonder that a lot of people in the public eye have opted for porcelain veneers. An actress can receive a perfect smile in the morning and appear on camera that evening. A supermodel can quickly and permanently remedy a discolored tooth, and go from the dental office straight to a photo shoot. At Sundance Dental & Orthodontics, we’ve handled hundreds of porcelain veneer placements, alone or with other procedures, like teeth whitening. Visit our smile gallery for some breathtaking examples of what cosmetic dentistry can do. If you’re considering porcelain veneers to achieve your sensational smile, please give our Farmington NM office a call and make an appointment. ‹ Not Happy With Your Farmington NM Dentist?